Larry Smith has been looking for his father’s grave for 40 years. Smith knows that his father, Reginald William Smith, was buried in 1950 in Section C of the historic, 22.5-acre Woodlawn Cemetery, the final resting place of many prominent African American figures of the late 19th century and most of the 20th. But badly kept records and a lack of maintenance for many years after the cemetery was abandoned in the 1960s have prevented Smith and others from locating their loved ones. Now, a volunteer association that has worked for decades to restore the cemetery hopes a system called ground penetrating radar, or GPR, will help Smith and other survivors. “I hope to find my dad before they put me in the grave,” said Smith, 60, a past president of the Woodlawn Perpetual Care Association board, which has owned and operated the cemetery since 1972. The GPR machine used at Woodlawn looks vaguely like a lawn mower and acts as a sort of navigation system, locating materials underground as an operator pushes it slowly across the grass. The machine sends radar waves underground and creates an image of what is below, and the image can be downloaded to a computer and analyzed. The technology is most often used at construction sites to detect pipes, electric lines and other metals in the ground, said Matt Aston, president of Ground Penetrating Radar Systems, a company that operates the system. Depending on the type of machine, GPR can detect objects as far down as 40 feet, Aston said. Companies have been using GPR since the early 1950s, but the technology has advanced, and a number of cemeteries in recent years have begun to see it as a means of conducting an inventory. The system’s ability to search cemetery grounds without disturbing them helps avoid past practices of digging up graves or sticking large metal rods in the ground to search for caskets, Aston said. Tyrone F. General, president of the Woodlawn board, has completed more than two years of training on the GPR system. He said it will take him at least three years to comb through the cemetery grounds. GPR was not being used in cemetery searches when Smith began looking for his father in 1970. 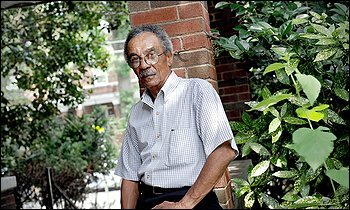 Smith was a student at Federal City College, now part of the University of the District Columbia, and longed to visit his father’s grave. “I couldn’t get in because the gate was locked and it was full of trash and debris,” he said. Two decades later, Smith answered a newspaper ad calling for volunteers to help clean up the cemetery and began volunteering on Saturdays. After a month, he was elected president of the association’s board, serving until 2000. It took the board two decades to get the cemetery in decent shape, said General, the current board president. The cemetery still needs funding, repair and daily maintenance, he said, and General said the association hopes to make money through the sale of burial plots. General, a retired Vietnam War veteran and D.C. police officer whose grandmother is buried in Woodlawn, said he hopes the $30,000 GPR system will help pinpoint caskets and unravel some of the mystery about how many people are buried there and who they are. General said he hopes the GPR system will help restore Woodlawn, whose history is steeped in struggle. Started in 1895 in what was a rural part of the District off Benning Road SE, Woodlawn was one of the few places that accepted the remains of black residents. Before, black District residents had to bury their loved ones in churchyards or Maryland cemeteries, General said. Several of the District’s most prominent African Americans, including the nation’s second African American U.S. senator, Blanche K. Bruce (R-Miss. ), chose to be buried at Woodlawn. As the city made room for Metro stations and other buildings during the 20th century, bodies from other cemeteries were moved there. It is home to more than a dozen mass graves, General said. Its last burial was 30 years ago. As the cemetery changed hands over the past century, those selling the land did not keep an accurate count of the cemetery’s available plots, General said. In the 1960s, Louis P. Bell and his son, Richard, who owned Woodlawn at the time, discovered bodies in sections that were supposed to be unused and abandoned their restoration efforts. The cemetery’s rolling hills quickly became overgrown with weeds and a dumping place for all kinds of debris. Locals formed the Woodlawn Perpetual Care Association with nine volunteer board members to help save the cemetery. In 2000, the group received a $300,000 grant from Congress to clean up the site, General said. An annual grant from National Harmony Memorial Park in Landover and private donations provide for its maintenance. But General said he hopes the cemetery might one day receive a steady source of income to help the association preserve and maintain it. “We can’t afford to let Woodlawn be forgotten,” he said. That is especially important for people such as Smith, who hold onto hope that the GPR system will guide them to their loved ones. “I just want to find my daddy’s grave,” he said.